When I listened to Mr. Gore's interview with Matt Truman on Inspired and Admired, I thought this interview would be a perfect opportunity to address a lot of misconceptions about TIFs. Specifically, Huber Heights TIFs. Mr. Gore was way off track on almost everything he said. In the table below, I have analyzed the 10 minutes that was spent discussing TIF districts. I highly recommend listening to this ten minutes in its entirety prior to reading the analysis. Then restart the interview and listen to what I transposed in the left most column. Then stop the recording and read my analysis. The TIF discussion starts about 40 minutes into the interview from the link above or here is a link to just the TIF discussion. If you do all this you will come to the conclusion that even though Mr. Gore studied the issue in depth, he has very little understanding of TIF districts in general. Worse yet he does not understand why TIF districts have been an issue in Huber Heights. I understand following my recommendation may take a lot of time. For those with just a few minutes, I have put some notations in the middle column to help direct you. The “B” indicates background information. Cells with * are ones that show pretty obvious misunderstandings that will hurt Mr. Gore’s ability to make good TIF decisions in the future. Mr. Wilson is the better candidate for Mayor but there is the possibility Mr. Gore may get elected. If he does he needs to find someone that can explain TIFs better than they were explained during his private sessions with city staff. Matt - A little bit ago you brought up the aquatic center and rose and things like that. Matt - now I don't know if you know but in 2015 I ran for city council. I came in dead last. But I tried. Anyway. One of the things that was the big topic was the TIF districts. There was a forum at Wiesenborn. They had asked, " what, I think someone asked me direct. What would you have done with the money in the TIF district? Because it was something at the time I was not for. And my answer was, "well I, if we’re going to play hypotheticals, and we can go back in time. Well I would have never voted for the TIF districts. I would probably now, having, you know, if hindsight is 20/20/ I would probably say yea. TIF districts are, um, I probably would have voted for them. B Though this exchange is Matt talking, there are a couple of key points to make about his comment. 1st. It is important to know that TIFs can be a good tool or they can be misused. Huber Heights City council has used this tool both responsibly and irresponsibly. Because the differences are subtle you have to understand both the law and the specific circumstances to be able to know the difference. The Montgomery County TIF created to pay for the I-70 interchanges was a responsible use of the TIF at least until 2010. Note: in 2010 the TIF had already produced enough money to pay for the I-70 interchange improvements. The Miami County TIF created to support the Golf Course Development and transitioned to Carriage Trails was a responsible TIF. Note – This does not mean it is responsible to use all the money raised through this TIF as a supplement to the developer. The Miami County TIF on Troy Pike supporting the Fire station was about to be implemented by council as an irresponsible TIF but through my efforts was created as a responsible TIF. Matt - What are your thoughts on the TIF the ROSE, the Aquatic Center. Things like that. Do you have a thought on these things? Jeff - Sure, I think the number one TIF is a. You know when I first started trying to wrap my head around TIFs, and how they were created, where the revenues came from, what they were to be used for, you know I spent a lot of nights with headaches, trying to understand how all these things worked. The important take away from this statement is Mr. Gore really tried to understand the TIFs. Keep this in mind as we evaluate his display of his knowledge the rest of this interview. Jeff - But ultimately, TIF districts were created back in the 60's in California, for the purpose of development. Matt - and that's what scared me. Well back then when I was doing research, I researched a lot of the California ones that had failed. That what at the time scared me was the California TIFs. Jeff - Ultimately what happens is the Federal government allows us, the city to, because you know we have. The reference to the federal government is incorrect. Probably a slip of tongue. Jeff - You know it’s all property taxes, so the county collects, you see the county collects property taxes. And then the county redistributes those property taxes to all the entities that get that money. The city gets their portion, the schools get their portion and so that money gets divided up. But all the money comes from actual property taxes. So let’s just talk about Carriage Trails. I mean. That has been a big issue that people have talked about for years. B The issue with the TIF created for Carriage Trails is how should we use the money collected from the TIF. Beginning with the first houses developed the city used TIF money to help the developer create lots. It was reasonable to supply $22,000 in supplements for the first few houses because the housing market was weak and the city needed houses to be built there so revenue would come in to help pay the loan that was taken out to build Carriage Trails Blvd. Later it was obvious the development was successful so I proposed we should reduce the $18,000 per house supplement to something lower. Of course, the developer did not want to lose this supplement. Many of their supporters claimed this would ruin the development. The last few amendments we reduced the supplement to $8,000 and $9,000. The development continued to sell houses at the rate they forecast to sell houses when they expected supplements of $18,000 or more. The development did not fail nor did it even slow down. I believe we could have adopted the $4,000 supplement I proposed at the time, instead of the $8,000 supplement, and they still would have sold houses at the same rate. Jeff - I guess. So the people that live in Carriage Trails. When those houses were built and they get their tax bill, their property tax bill goes to Miami County. For the Miami County TiF. Now normally, since they live in Miami County. Huber Heights is Montgomery county. When Miami County divies up that money and sends it back and redistributes that money, we never would have got that money to begin with. If there wasn't a TIF. So, we are actually collecting and keeping property tax money to the tune of about 40 45%. Which equates to, I believe, about 12 to 1400 dollars per roof top that's built in Carriage Trails, over a 30 year period. The money that we are collecting in a TIF, we never would have received in the first place, if we didn't establish that TIF. This is the argument those that make decisions that favor the developer give to justify giving the developers more TIF money than they need for a successful project. Those of us that make decision that favor the city, advocate for making sure the development is successful, but the city should keep as much of the TIF money as possible in the City coffers. We should do this because that money can be used to pay for things put in that area such as stop lights ($120,000 each), water tower ($3 million) and the proposed high pressure water district ($2.5 million) that currently we are paying for using other funds. 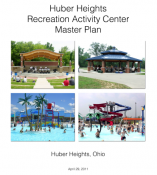 Jeff - Now where the city benefits as well, even though it is in Miami County, its consider the City of Huber Heights, so all the people that live in Carriage Trails are paying income tax to the City of Huber Heights. And as we know income tax is the biggest source of revenue of the City. It's not property tax. This is a true statement whether the developer gets the supplement or not so it does not provide a reason to give them the supplement. Jeff - Without a TIF typical property taxes that come back to the city are 5 or 10 % because the schools get the majority of it. * This a true statement that has nothing to do with whether we should be giving the developer a supplement and it is inappropriate when talking about the Carriage Trails Miami County TIF. This is because that particular TIF gives the schools all the money they normally would receive. His acknowledgement that some TIFs take a lot of school money is needed to understand the issues that come up when talking about the Montgomery County TIFs. Jeff - Now, so Miami County had to agree to that TIF, the school board, the Huber Heights City School board had to agree to that TIF, and this year 2017 we will be writing to, we have already written to the schools for almost, a little bit over half a million dollars. And somewhere between now and December we will be writing another check for, out of that Miami county TIF to the Huber Heights City Schools for about another $500,000. So, it’s just a matter of being patient and letting the TIF districts build and develop. Collect all that property tax money and then we're getting. you know we're giving money to the tune of about a million dollars back to Huber Heights. *** This shows a major misunderstanding of the TIF and he continues this misunderstanding long enough so that we know it is not just a slip of the tongue. 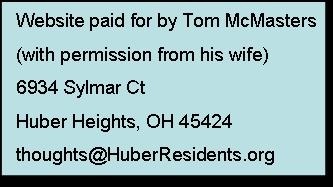 We do not send any of the money collected from the Miami County TIFs to the Huber Heights City Schools. The million dollars he references comes from collections from the Montgomery County TIFs. Jeff - Now from Miami County with the Bethel Schools, that's considered a non-school TIF. So the schools there are still getting the same amount of property tax going into their schools as they would have been without the TIF. If it had just been straight property taxes. This true statement is one reason why I have always classified the Carriage Trails Miami County TIF as a responsible TIF. Jeff - So what a lot of people are concerned and worry that we are providing all these subsidies out of general fund tax dollars, from the City of Huber Heights. So that's not the case. * None of the city decision makers that favor the city have ever claimed the subsidies were coming from the general fund. Those that think the city should be providing unnecessarily high supplements to the developer, make statements like this to plant this notion and cause confusion. Jeff - The TIF money is coming from Miami County to the City and the subsides we are providing come out of a TIF fund that we would never had, had the houses, had the development, not occurred in the first place. True, but does not justify providing higher supplements to the developer than is necessary for a successful development. Jeff - So all that development is happening. So, Miami County is paying us money to build a development, that attracts people to live there that now pay the income tax to the City. Don’t know if I should quibble on the fact that Miami County doesn’t pay us money to build a development or not. The Miami County Treasurer/auditor does act as an in-between from the residents that pay the tax, to the city that receives the taxes. Jeff - On top of the assessments and water tap fees. You know Huber Heights we own our own water company. We provide water, so this is a good thing. This is again a true statement. Those that make decisions that favor the developers interest over the city interests stop after citing these facts. They refuse to tell you there are also costs the city occurred because of the development. They will not assess items like the need to build a new water tower ($3 million ish) and the desire to build a high-pressure water district ($2.5 million) that were triggered because of the new development. If I recall recent discussions, water tap in fees run $700 a house. Fully developed Carriage Trails is expected to be 1200 homes. This would result in about $840,000 of revenue in tap fees to help offset the $5.5 million dollars of expenditures in additional water infrastructure projects provided because of the additional homes. Even if you allocate half that costs of these expenditures to the existing houses off of Shull rd. The needed expenditures far exceed the revenues. Jeff - But its understanding all the moving parts and pieces. You know to how that works. Jeff - So, TIFs are just a way that communities can invest in their communities. Provide infrastructure, and then re-capture property taxes that would normally go to the county. We get to keep. We get to retain that. Jeff - Yes, a lot of that is school money, but the schools will ultimately catch up and they will receive the money that they should. *** Up until this point he has only talked about the Carriage Trails Miami County TIF. Earlier he correctly noted that The Carriage Trails Miami County TIF is a non-school TIF meaning all of the taxes collected because of school levies will be received by the school. Earlier he confused the payments to the Huber Heights Schools. But he really has not provided any background on the Montgomery County TIFs. The Montgomery County I-70, Lane Park and Family Dollar TIFs do have a significant percentage of school tax levy dollars that get funneled into the City TIF collections. When talking about the Montgomery County Lane Park TIF, keep in mind, the city provided no infrastructure improvements to entice this business to come to Huber Heights. In fact, the business had already entered into a deal to purchase the property before they approached the City. The development was on the way to providing an estimated $256,000 a year in property taxes to the schools. Because of a loophole in the law, the City was able to stepped in and created a TIF district which resulted in the city getting $180,000 of the school’s $256,000 for the next first ten years of the TIF. True, in ten years Huber Heights City Schools will start to receive the additional $180,000 they should be getting today. But they will never recover the $1.8 million dollars they should be getting during these first ten years. Unless --- I am successful these next couple months in convincing members of council to convert that TIF to a non-school TIF. This is something that should have been done when it was first created. I am still hopeful at least a couple of council members will act responsibly. Matt - So ah, if I may play devil’s advocate. If property values decrease how does that effect the TIF? For those listening. Jeff- Well, it will just be less revenue that would be coming into the kind of what we would call the TIF account. The property value, I mean, we know, those are flexible. I think. If you talk to anybody, who’s ever sold anything in real-estate tell you that is the safest investment. Because we know that markets fluctuate. So sometimes, you know, property values will go down but then they get reassessed. Property values go up. In fact, I believe, I attended a school board meeting where Karl Keith, the Montgomery County auditor spoke, and during these new assessments they are doing, you know it’s kind of a good thing bad thing. So, property values have been reassessed in Montgomery County and they increased. So, the bad side of that is people property taxes are going to go up. because their property values are going up. But now property taxes going up and all that money in non-TIF districts are all going to the schools. Helps the schools and everything else. We are in a period where property values are going up and demand for housing is going up. And that is just basic supply and demand in economics. We had a demand for housing and as demand grew for housing so does property values. And that's where we are at right now. That's the environment we're in. So, I don't see property values going down, I think from the 2008 market crash we've gone down about as far as it could go. So now we are back on the upswing. And we’ll just going to be reaping the rewords of those property taxes in those TIF districts. So, this will help fund and pay for all the other things we've done that ultimately have tried to increase the quality of live for the residency. Namely the Aquatic center and Rose. And the Y and who knows whatever else we can do in the future that will increase and help the quality of life for the people that are here. It is a good thing. It is a good thing. This exchange doesn’t really address the TIF. Later they get back on the subject so I left this here for context. As an aside, Ohio has a rather unique characteristic when it comes to tax levies and county wide re-assessment of properties. The first 10 mils of tax levies is referred to as inside millage. Inside millage reacts to county wide re-assessments just like most people believe. If your house goes up in value the amount you pay for that millage goes up that same percentage. However, all the rest of the property tax you pay does not work like that. That property tax is referred to as Outside millage. What determines how your tax rate changes for that millage is how much your house value changes as compared to the average change of all the properties that are covered by that levy. So, if your property value goes up 10% but the average property value covered by that tax goes up 20% your property tax for that millage will actually go down. With 85 mils of levies on my property the effect of the 75 mils of outside levies outweighs the 10 mils of inside levies. From his response, Jeff does not seem to understand this. Jeff - And that TIF right now the Montgomery and Miami County TIFs. There's something like 4 to 6 million dollars in that TIF account. It's just sitting there and could be used for, you know, Right now that money is sitting there because we still need future development in order to collect enough money annually to pay off the debt service expected for the TIF projects. This money provides some additional working funds. Soon there will be additional development and there will not be as much of a need for these reserve funds (but it would be fiscally responsible to have some and this level could be the right amount even then). Jeff - that all leads into the 2025 plan. You know our 2025 plan says that by 2025 and it may have to be adjust to 2026 or 2027 based on how the annual tax bills come in. So even if that gets modified, we still have a plan that solves and works and we know we will have enough money in those TIF funds that pay all the debt service on all the things that we have from 2025. It is true that the third bullet in the original presentation highlights the TIF aspect of the 2025 plan. However, the real purpose of the proposed TIF was to make it so the levy we passed in 2005 to build the fire station could be diverted from building the station and used instead for fire operations. This wasn't necessarily bad, once I was able to change Council’s plan and was able to limit this TIF to a Non-school TIF, but the creation of this TIF was not a big influence on the other city TIFs and it did not help them pay for other projects. Remember the 2025 plan was mostly a marketing ploy to get people to support the Income tax levy. Also remember, the income tax levy is one of the incidents that convinced me that I should not have private discussions on policy with the City Manager. It was my assessment that the economy was going to turn around and revenues from income taxes would rise enough because of that turn around that it was not necessary for us to tell people we needed the tax levy to “maintain” our current level of services. In fact, since the 2005 levy had already collect nearly enough money to pay for a new fire station, I wanted the city to commit to honoring that pledge and get started on that project before the vote on the levy. After I conveyed my thoughts and desires to the City Manager, he started going to town halls and tellimg people, “anyone that wanted to build the fire station before the new tax was created was irresponsible”. Looking at the last couple years of revenues, we see income tax revenues increased by more than the $1.5 million dollars projected by the .25% increase. Jeff - No money out of the general fund gets spent. It’s all funded by TIF dollars. And understand how that works is key *** This sentence makes no sense in the context of the 2025 plan. The 2025 plan is 95% concerned about operating funds, which are all related to the General fund. The TIF dollars talked about in the 2025 plan only influence the funding of the fire station construction which is a tiny concern compared to the rest of the items within the 2025 plan. Jeff - There is a bid sports complex that was just approved by Warren County Commissioners. down in Warren County. I thinks it’s a 17, 18 million dollar sports complex. They are building down there. In the article they clearly laid out every bit of that infrastructure everything done there is all being done and funded by TIF in Warren County. Matt - TIFs are popular. Jeff - People are excited about that. Think that's a great idea. What they have done in Warren County. To build this big sports complex, facility, complex. Is going to attract hundreds of thousands of people. Bringing lots of revenue out to Warren County. Is no different than from what we've done with Carriage Trails, the Aquatic Center, and the Rose. No different. Articles like the one referenced in this conversation should prompt investigation. Only after you see all the details is it wise to hype the activity as being overall positive, negative or neutral. Remember TIFs are a tool. When used correctly they are a great asset to the City and to the School districts. But they can be used irresponsibly too. Other recent TIF articles What is TIF? Why are the Lane Park and Family Dollar TIFs irresponsible?